HDC(Histidine decarboxylase) is the enzyme that catalyzes the reaction that produces histamine from histidine with the help of vitamin B6. The HDC gene is mapped on 15q21.2. The deduced 662-amino acid protein has a molecular mass of 74,148 Da. The gene contains 12 exons spanning approximately 24 kb. The biogenic amine histamine is an important modulator of numerous physiologic processes, including neurotransmission, gastric acid secretion, and smooth muscle tone. The biosynthesis of histamine from histidine is catalyzed by the enzyme L-histidine decarboxylase. This homodimeric enzyme is a pyridoxal phosphate (PLP)-dependent decarboxylase and is highly specific for its histidine substrate. Ercan-Sencicek et al. noted that animal studies had shown that lack of Hdc in mice results in increased locomotor and stereotypic behaviors, as well as increased anxiety. Western blot analysis of HDC expression in rat fetal liver tissue lysate. The antibody detects the 73 kDa full length HDC in samples from human, mouse and rat origins. Western blot analysis of HDC expression in rat fetal liver tissue lysate. 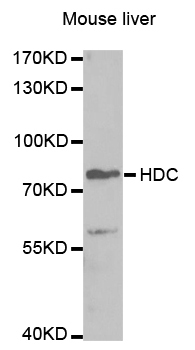 Western blot analysis of extracts of mouse liver, using HDC antibody.